– Advocacy. Protecting and defending your right to practice your profession. 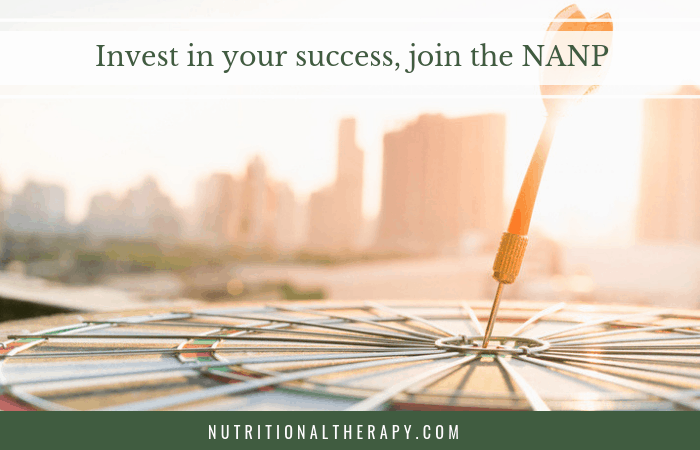 The Council of Holistic Health Educators has proven to be an important NANP ally for keeping on top of pending legislation that could negatively impact your ability to follow your true calling as a holistic nutrition professional. Through this relationship, NANP members gain visibility and are invited into national conversations on diet and nutrition. Continued growth as an organization ensures that nutrition professionals are no longer left behind or left out of crucial decisions that affect not only you, but also your clients who are struggling with today’s allopathic approach to healthcare. – Credibility. Ensuring that the highest educational, professional and ethical standards are in place for those who belong to the NANP. In today’s world where nutrition credentials are deeply scrutinized, your NANP membership mitigates the worries clients may have in deciding whether you are qualified to help them. And their board certification, the “gold standard” credential for the profession, is available only to professional members of the NANP. Those who earn this designation are finding more opportunities in the market and are attracting higher fees for their services, too. – NANP views their community as family. If you are a solo practitioner, you know how lonely it can get out there! Your membership gives you access to many hundreds of like-minded nutrition professionals around the world who are actively engaging with one another for clinical and emotional support. In a world of increasingly greater disconnection and “virtuality,” this single aspect of being an NANP member is, for some, worth its weight in gold. – Last, but not least, is their commitment to your growth: clinically AND financially. This is where things get very exciting in the coming year! NANP’s conference, webinars, CEU providers, approved school programs, and business-building tools are thoroughly vetted for excellence, saving you time and frustration trying to figure it all out on your own. We think you’ll love what they’ve created for you on this front. Take the next step in your NTP/C journey and join the NANP today!